I’m so glad chili season is upon us! The other day, when Tim picked me up at the bus station after work, at around 11pm, I made him drive me to our local (thankfully 24h) diner because I just HAD to eat a bowl of chili! The diner chili was okay, but it was nothing compared to homemade chili. So my cravings were pretty much still alive inside my body, whispering in my ears: chiliiii, chiliiiii! Creepy, I know! I couldn’t bear it any longer, so the next day I went to the store and got everything I needed for one of my favorite chili recipes: Sweet Potato Chili. A vegetarian, yet very tasty chili to please my sweet potato lover husband! I don’t know if my sudden chili craving had anything to do with the fact that I got a bad cold. Probably… I always crave comfort food when I’m sick! I am in fact battling this so-called cold for the past week or so. Tim finally got it too (I was hoping his manly strong genes would protect him, even though we share a bed) and now I’m taking care of a very cranky sick boy! Why is it that we, women, can work 2 double shifts in a row even though we are sick, but the second our husbands get sick they act as if it’s their last night on earth? Thank goodness for comfort food! And thank goodness for delicious Sweet Potato Chili to nourish us back to health! I gotta say, Tim and I aren’t really into extremely spicy food. This chili definitely has some heat and any more than that would be too much for us! But that being said, I’m kinda glad for its spiciness! Nothing like something spicy to clear you up when you are congested! Too much information? Sorry! ? For this chili, I used both the RO*TEL chunky diced tomatoes with green chilies and the Hunt’s crushed tomatoes that I purchased at my local Walmart. RO*TEL has a mild variety of that same product, so if you’re not into spicy food, just get that instead. I like using canned tomatoes because they make my life so much easier! I’m already so stressed with everything else, at least dinner making needs to be semi- therapeutic, right? I also chose to use black eyed peas because I’m kinda obsessed with them. They are my mom’s favorite, but I avoided them during my whole childhood. When I finally tried them, I was hooked! Now, I always have a couple of cans in my pantry to use in salads, stews and chili. I honestly think they paired perfectly with the sweet potatoes! If you know me, you are probably really surprised that I didn’t add any protein to this chili. I got so inspired by all the pretty bright colors in the chili, with all the veggies, that I really didn’t think to add any meat. However, if you still think you need your protein fix, I think ground turkey would go great with all these flavors! Meat or no meat, this chili is amazing, healthy and is perfect for those cold nights when all you are craving is a bowl of comfort food. Don’t forget to add a lot of toppings. My favorites are sour cream and a lot of shredded cheddar cheese! ? In a large dutch oven, heat the olive oil, over medium high heat, and sauté the onions until translucent. Add the garlic and cook for another minute, being careful not to let it burn. Add the peppers and the sweet potato and cook with the onions/garlic for a few minutes, or until the veggies soften and develop some color. Add the tomatoes, the corn, the black eyed peas, the maple syrup, the chili powder, the cayenne (if using), the cinnamon and the oregano and cook, stirring constantly, for 30 seconds, or until the spices are fragrant. Cover and reduce the heat to maintain a gentle simmer. Cook for 30 minutes, or until the sweet potato is tender. Uncover and cook for 15-30 more minutes or until slightly reduced. Refrigerate for up to 3 days or freeze for up to 3 months! « Lola Conquers Woodstock, NY! What a total bummer that you both are sick! 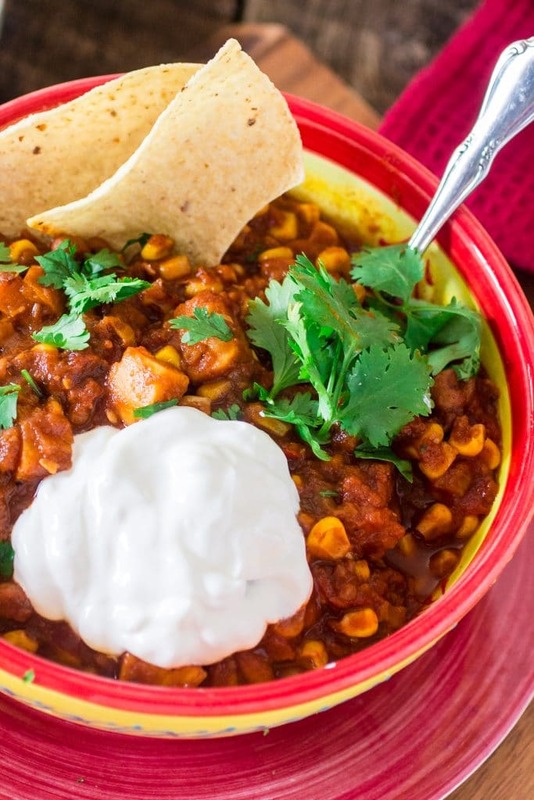 This chili should get you back on track ASAP! I’m always stuffy this time of year and totally combat it with spicy food too! I’ll have to add your gorgeous soup to the rotation! love it! I could eat soup or chili every single day during the cooler months,. This looks great. Love the addition of the sweet potatoes! Sweet potatoes in my chili? Yes Please! Such a great way to get more vegetables in my diet! This sounds like a rich flavorful chili that should help knock out those fall/winter blahs. Sorry you aren’t feeling well, get better soon! I love sweet potatoes in chili and think your addition of black-eyed peas is amazing! Chili is such a great comfort food…especially in this cooler weather. We do like having “meatless” options now and again…and the use of sweet potatoes is great in this recipe. Love the addition of corn and black eyed peas as well. We just finished off a big pot of meaty chili, but I love your vegetarian version! Love the colors! 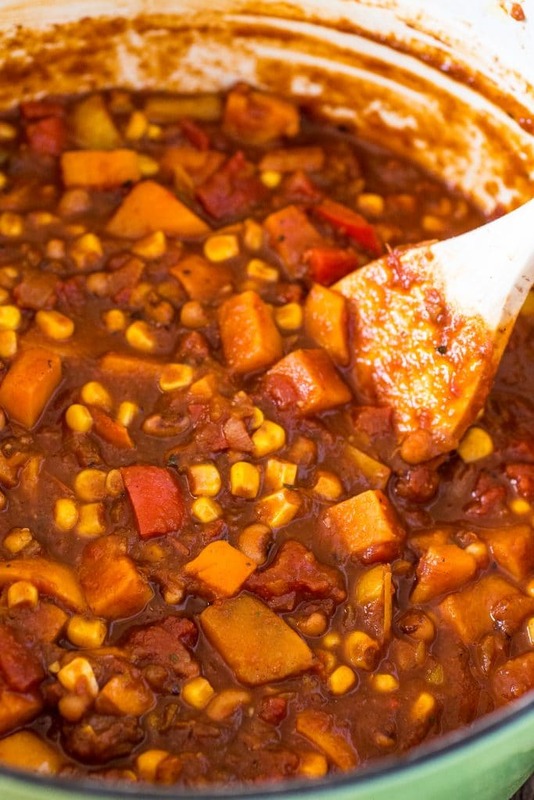 This sweet potato chili looks delicious – I haven’t tried it yet with sweet potatoes – definitely will have to!! And I really love the idea of using black eyed peas! I would have never thought about adding sweet potatoes to chili. Very creative and looks delicious! YUM! I want a big, comforting, cozy bowl fo this chili goodness! So delicious! Chili is my favorite comfort food! and with sweet potatoes – perfection!